~~Tino Thiele and Jens Roder joined forces under the Wulfgar banner, being named after the barbarian warrior from Icewind Dale, created by American SF / fantasy novelist / author Robert A. Salvatore. They are not to be mistaken for the Swedish (Death Metal) band, for your information! This Brandenburg-based duo did record the Heidenwahn album after quite a long period of silence; the last album (Jens wasn’t part of the project yet) was released in 2008, so for the ‘fans’ is might have been quite a period of impatience and uncertainness. But hail the pagan lords for Tino decided to continue with this mighty entity, about ten years after its birth. Kindly helped out by the professional assistance of Pesttanz Klangschmiede (I did several reviews for them in the past – enter the label’s name in the ‘search’-tab and you will find my thoughts about a couple of fine recordings – and there are a handful to come up next in the near future as well), this fifth full length studio album has become an attractive eleven-tracker that clocks forty-three minutes. The release’s lay-out is quite minimally composed – a simple (not meant, and I mean NOT meant, the negative way) cover painting, the lyrics in an easy letter type, a picture of those two musicians, and a cool negative-coloured picture at the backside – nothing more, nothing less. But it sticks to the essence, focusing on the victorious play that characterises Heidenwahn. Heidenwahn (it means something like heathen mania or pagan delusion) is quite an unusual album, for this is the kind of Black Metal that is not necessarily easy to label under one or another sub-genre that easily. The fundaments are based on the essence of the Second Wave, but for sure not as being a clone of that inherently present Scandinavian scene. No, it’s just the border lines that refer to the scene from two, two and a half decades ago. This project adds something quite unique, even Post-like (no, Wulfgar are not a Post-Black band! ), going for both sound and performance. And then again, several times that tradition of Epic persuasion à la the Nineties reappears, conquers, convinces. But let’s come back to the distinctive aspects. I mentioned sound and performance. Well, that sound is somewhat mechanical, but that might have to do with the mix. This one is little imposed, let’s say, with especially a guitar production that feels way too avant-garde. I do not know whether it was meant to be that way, nor am I sure if I am convinced about the greatness of it, or am I feeling not that comfortable at the other hand??? But for sure it’s different, distinctive. Yet then again, there is room for every instrumental actor, with a nice balance for all elements. Actually, I like the fact that the vocals, which aren’t that common either (no ‘screams’ whatsoever, yet rather like hoarse throat-shouting), are not pushed too fiercely on the foreground. Yet still I have to be honest and to warn you, dear listener, for the sound quality is quite ‘apart’, and it might be a turn-off. …or a turn-on… There is quite a variation in tempo in each single song, with slower and little faster excerpts. Never it blows into eclectic blast-parts, but in any case it shows an energetic persuasion, no matter whether a piece is slower or faster. The addition of experimental excerpts and creative elements is quite remarkable, for about each single composition has something that is distinctive from what we’re used to. 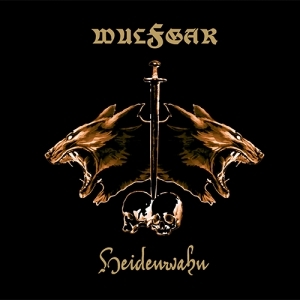 Okay, it does not mean that you need to appreciate it, or that you simply adore that somewhat strange turn, but it characterises Wulfgar’s latest album for sure. Yet then again, all songs are, at the same time, quite typifying for the band (once again I refer to the cohesive aspects of the tracks), as well as differing from many things we’re getting in touch with lately. After three listens I am still confused, for I am not able to ascertain my impression about this album. Sometimes it gives me an uneasy feeling, for I feel disconnected to the material. Then again, my masochistic identity, subtly and modestly dwelling somewhere deeply hidden within my subconsciousness, tells me to focus on that weird attitude, those weird but creative (?) details that are courtesy of Wulfgar. Especially within the more epic-oriented excerpts I do reach a certain level of satisfaction, but that, of course, isn’t but a subjective and personal opinion. So is the score, of course, simply expressing my personal sentiment at this very moment.